AMS Instrumentation and Calibration introduces a new range of switches from FCI designed specifically to withstand harsh environment applications. AMS Instrumentation and Calibration announces the release of a new flow switch from Fluid Components International (FCI). 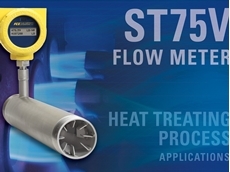 AMS Instrumentation and Calibration introduces a new direct mass flow meter from Fluid Components International (FCI). AMS Instrumentation and Calibration introduces a new point level monitoring and control switch from Fluid Components International (FCI) for process and plant engineers. Designed to support high reliability application environments such as chemical refining, food and beverage, oil and gas, electric power, metals and mining, pulp and paper, and water and wastewater treatment among others, the high accuracy FLT Series switch features dual trip points and relays, SIL 2 rating for ultra-reliability and full Ex agency approvals on the complete instrument. Point level monitoring and control are essential in many industrial processes to prevent over-filling or under-filling, as well as to provide a reliable ‘empty’ notification. Accurate switching ensures continuous plant operation while interruptions could lead to quality issues, safety problems, regulatory issues and higher costs. 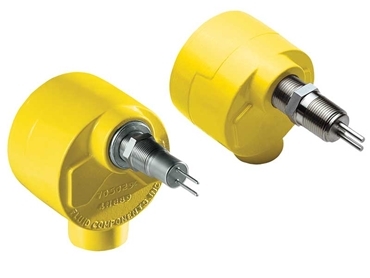 Providing dependable point level and interface sensing in liquid, gas or foam, the FLT switch is ideal for heavy duty environments (FLT93S) and small process connections requiring a fast, responsive switch (FLT93F). The point level monitoring and control switch is also used for wet/dry detection, sump level detection, high/low level alarm and control, interface control in separation vessels, foam and sediment interface control, and agitation detection. 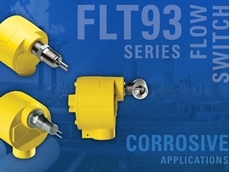 Key features of the FLT93S point level monitoring and control switches include ability to identify the interface between any type of media including foam, emulsion layers, liquids and slurries; dual switch point option allowing one instrument to control two different product interfaces; two or more switches ideal for controlling product discharge and intake at specified points; operable over a wide setpoint range in water from 0.003 to 0.9 MPS; level/interface accuracy of ±6.4mm, and measurement repeatability of ±3.2mm; ability to withstand operating temperatures from -40°C to +177°C; and an optional configuration available for temperatures from -73°C to +454°C. Built-in temperature compensation thanks to the advanced thermal dispersion mass flow sensor in the FLT switch ensures repeatable and reliable operation, even in extreme environments. This automatic compensation adjusts the instrument for changes in operating environment temperatures to ensure the trip points will remain accurate, preventing false alarms and improving end-product quality, maximising safety and also allowing alarms to be set within a narrower setpoint range. 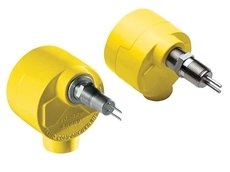 The FLT switch is hydrostatically proof pressure tested to 240 bar (g) at 21°C. Derated with temperature, the maximum operation service recommended is 162 bar (g) at 260°C. Higher pressure ratings are available with special construction and test certification. FCI’s FLT switches come with a wide selection of standard and custom process connections. The electronic control circuit can be integrally mounted with the sensing element, or located in a remote location. The standard enclosure is made from a coated aluminium alloy, which allows use in ATEX locations and is rated for NEMA Type 4X (IP66) environments. Stainless steel or fibreglass enclosures are also available. For further information, please visit the AMS Instrumentation and Calibration website www.ams-ic.com.au or call 03-9017 8225, or Freecall (NZ) 0800 442 743.